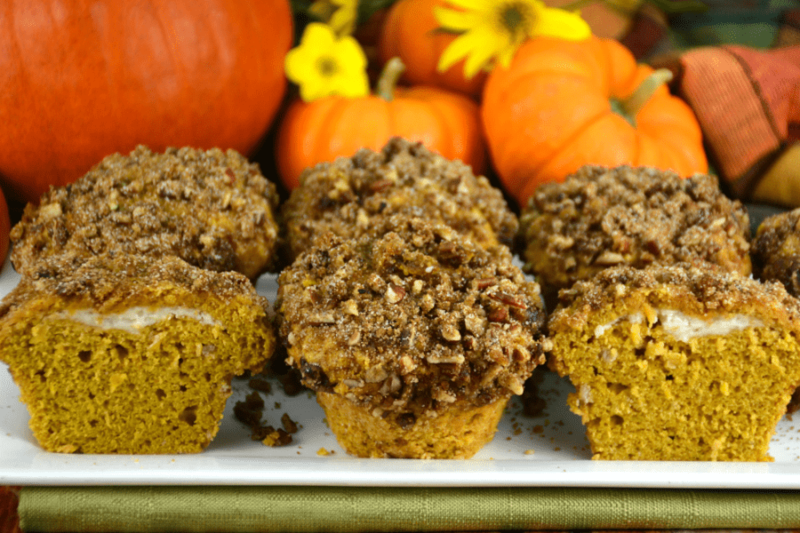 This recipe for Our Favorite Stuffed Pumpkin Muffins is a definite favorite around here, especially at this time of year! I always make them for my son, whenever he requests them, and thank goodness it is not too often! It’s times like these I am glad he is out on his own because I just can’t stop eating most of the sweet treats he loves if I have them around the house! 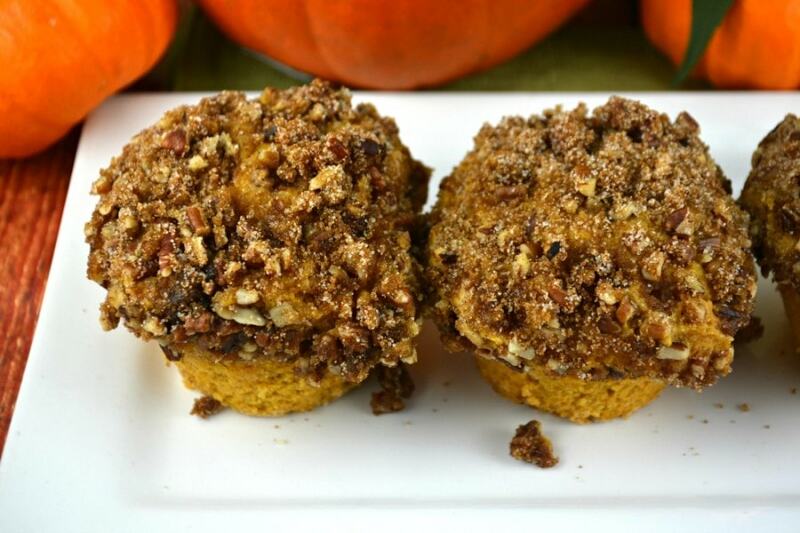 The praline pecan topping all over these muffins is so tasty! Not a requirement but well worth the effort! Its funny, my husband eats the tops of muffins first and I always eat the bottom first because I believe in saving the best for last! I’m curious to hear how you prefer to eat them! I figure there has to be someone else out there that eats muffins the same way I do. Isn’t there? 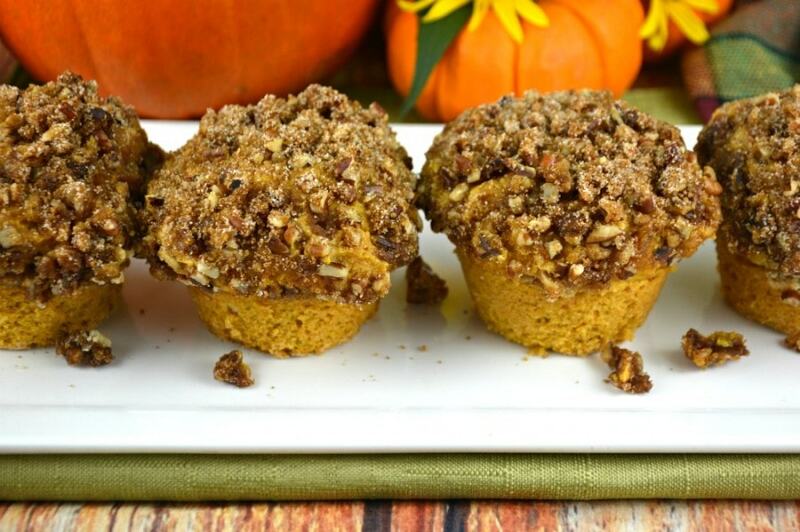 Our Favorite Stuffed Pumpkin Muffins are so good. I just love the cream cheese center. Again, while stuffing these muffins with cream cheese is not a requirement, it is definitely worth a try. I believe it makes these muffins taste even better. I usually make sure the cream cheese filling is near the top because I love to eat the top last but you can easily place the filling lower into the muffin batter if that is what you prefer! Even if you desire plain, moist and delicious pumpkin muffins this is definitely the recipe for you! I have made them plain a few times myself and enjoyed them. They all disappeared so I believe everyone else loved them too! I just don’t mind taking a few extra moments to create the perfect muffin that includes the cream cheese stuffing and praline pecan top! Well I think they’re perfect and I am pretty sure you will agree! In the fall especially this is one of my go to recipes for any gathering my family attends! I am always asked for the recipe and now instead of writing it out or photocopying it I can just give people this link! My life just got a whole lot easier! 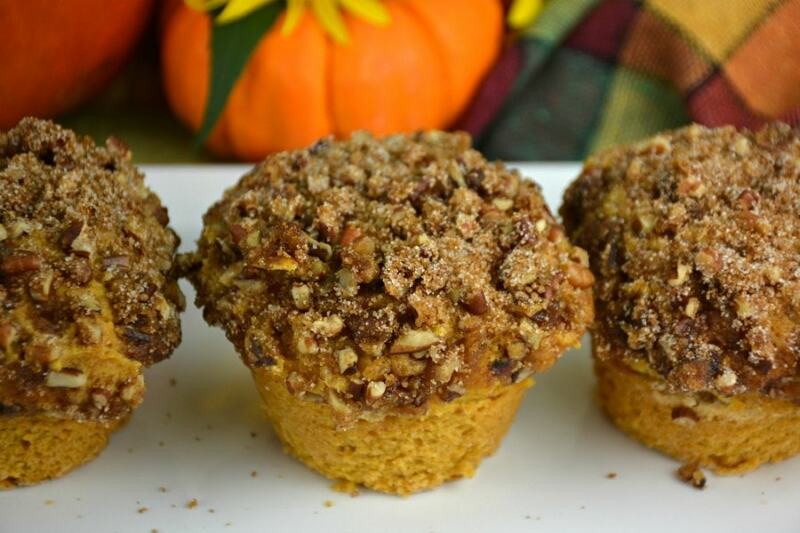 The fall also makes me think of our Apple Pie Muffins. My grandparents were farmers and I always think about all of the things my grandmother used to make with all of their apples when they were ripe and ready to eat! This isn’t her muffin recipe but I always remember her complaining about what she was going to do with all of the apples every year! Actually, she used to complain when corn, tomatoes and every vegetable they grew was in season! She used to can most of it. Oh the good old days! I just wish I had the time to grow as many vegetables as my grandparents did and can myself! Unfortunately that is not likely to happen any time soon! I was so excited to finally make a video of Our Favorite Stuffed Pumpkin Muffins just so you can see how to make them for yourself! If you have a moment take a look below! In a small bowl combine sugars and cinnamon. Set aside. In a medium sized bowl, combine pecans, sugars, and salt in bowl. Add corn syrup and vanilla. Stir, using a spoon or your fingers, until blended. Set aside. Using a handheld or stand mixer, blend cream cheese, icing or powdered sugar and vanilla together. Set aside. You will be adding about 2 teaspoons of the cream cheese mixture to each muffin. Set aside. Preheat your oven to 350 degrees. Prepare a 12 hole muffin with cooking spray and a light dusting of flour. Set aside. In a large bowl, whisk flour, sugar, pumpkin pie spice, baking powder, and salt until blended together. In a separate bowl, combine pumpkin, melted butter, eggs, milk, and vanilla. Gradually stir flour mixture into pumpkin mixture until just combined. Do not over mix. Grab your muffin pan and fill each of your cups up about half way. Using a soup spoon press a hole down into the batter, large enough to hold approximately 2 teaspoons of the cream cheese mixture. Next, add the cream cheese mixture to each hole for each muffin. Now you need to add the leftover batter to each muffin and make sure the cream cheese mixture is totally covered. Your muffins should be filled to the edge of each muffin hole. 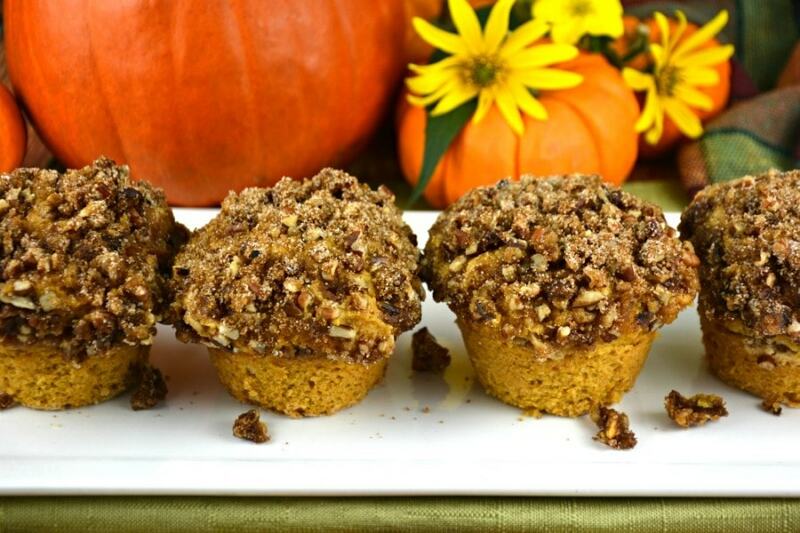 Using your fingers, cover each muffin top completely with the pecan topping. Make sure to use it all. Sprinkle the top of the pecan mixture with cinnamon sugar. I sometimes don't use all of the cinnamon sugar. In fact, I usually have some left. I was going to post this recipe with half of the amount but my friends told me they use most or all of it so I leave the decision up to you! Bake until a toothpick inserted in center comes out with a few crumbs attached, about 35 minutes. Remember to rotate your muffin pan halfway through baking if you have hot spots like I do. Allow your muffins to cool in your muffin pan, on wire rack for about 10 minutes. Then remove your muffins from the pan and put them on a wire rack for about 5 more minutes if you can wait that long! Enjoy! I could eat your pecan crumble topping all day and so could my husband. I just love this recipe. 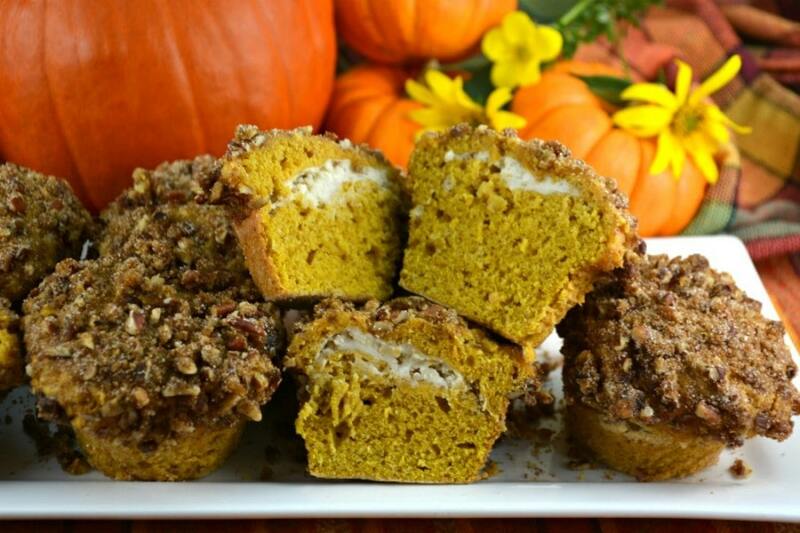 Best pumpkin muffins ever. Thank you. I have been baking for forty years and these are the best pumpkin muffins I have ever made. Looking forward to making your pumpkin pie next. Thank you for sharing it. Love the site. These are so good. I’m making them again for my parents this weekend. Thank you for sharing. I love your site. 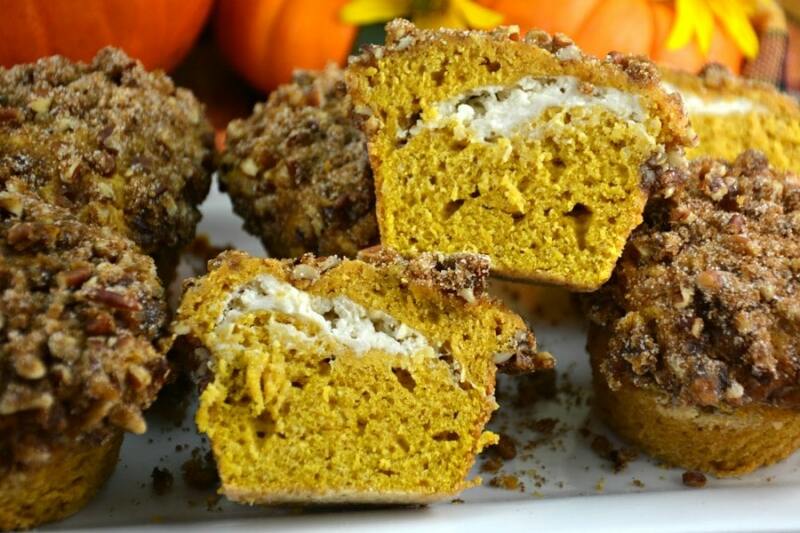 These are the best pumpkin muffins hands down I have ever tried. I love the pecan topping. Thank you for sharing. I will be making these again.